Organic foods. They are amazingly popular. More than a million Australians buy organic foods regularly, and several million more buy it occasionally. The retail value of the organic market is estimated to be more than $1 billion annually. The assumption made by most people is that because it’s so popular, organic foods must be good for you, or at least have something going for them to make them worth all the hype. Of course, just because something’s immensely popular and has a billion-dollar turnover doesn’t necessarily mean it’s beneficial (One Direction is a case-in-point). In fact, despite organic foods being touted by their supporters as healthier, safer, and better for the environment than normal foods, actual scientific evidence fails to show any significant difference. I wrote about this earlier in the year (see: Borderline Narcissism and Organic Food). Since then, another large prospective trial deflated organic food’s bubble, with a British study showing no change in the incidence of cancer in women who always ate organic foods versus those who never ate organic foods . The dearth of benefit from organic foods wouldn’t be so bad if they were just another guy in the line-up, something neutral and inert. Unfortunately, not only can organic produce be contaminated if farmed incorrectly [2, 3], but they come at an extraordinary premium, sometimes costing four times more than their conventional counterparts (Borderline Narcissism and Organic Food). Dr Caroline Leaf is a communication pathologist and a self-titled cognitive neuroscientist. A couple of months ago, she let slip her intention to publish a book in 2015 about food. Who knows what she’ll actually say, but if today’s social media meme is anything to go by, it will likely follow the same pattern of her other teachings. As I discussed recently, Dr Leaf does herself a disservice by not citing her sources. 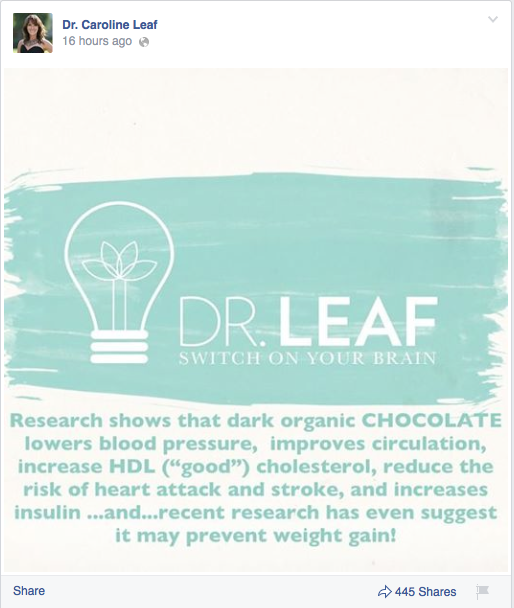 It’s very brave to write in a public forum that dark chocolate reduces the heart attack and stroke, since this could be interpreted as medical advice, which she is not qualified to give. As for the actual effects of dark chocolate, there is not a lot of quality evidence on dark chocolate on its own. A 2011 meta-analysis of general chocolate consumption on cardiovascular risk did indeed show a relative risk reduction of 37% . But before you prescribe yourself two dark chocolate Lindt balls twice a day, consider that a relative risk reduction of 37% isn’t a big effect. Plus, the recommended 50 grams of 85% organic dark chocolate to attain the small benefit for your cardiovascular health contains just over 300 calories/1280 kJ (the average can of Coke contains 146 calories/ 600 kJ), and is 30% saturated fat (http://caloriecount.about.com/calories-green-blacks-organic-dark-chocolate-i110689). So any health benefit that may be associated with the poly-phenol content is likely nullified by the high saturated fat and calorie count. What concerns me about Dr Leaf’s future foray into dietetics is that little word sitting quietly in her opening sentence: “organic”. Dr Leaf is an organic convert. But rather than act like a scientist that she claims to be, she preaches from her biases, ignoring the evidence that organic food is all hype and no substance, encouraging Christians everywhere to pay excessive amounts of money for something that’s of absolutely no benefit. Dr Leaf is welcome to eat whatever she chooses, but encouraging organic eating without clear benefit is more hindrance than help for most of her followers. This entry was posted in Biological, Caroline Leaf and tagged blood pressure, calorie, cancer, cardiovascular, cardiovascular disease, caroline, caroline leaf, chocolate, cholesterol, coca-cola, cognitive neuroscientist, Coke, contamination, criticism, dark chocolate, dr caroline leaf, Dr Leaf, E coli, endothelial, endothelial function, environment, Facebook, HDL, heart attack, hypertension, incidence, insulin, insulin sensitivity, Leaf, Lindt, meme, neurobiology, One Direction, organic, organic food, organic foods, pesticide, poly-phenol, polyphenol, pseudoscience, residue, saturated fat, stroke, weight, weight gain, weight loss by cedwardpitt. Bookmark the permalink.